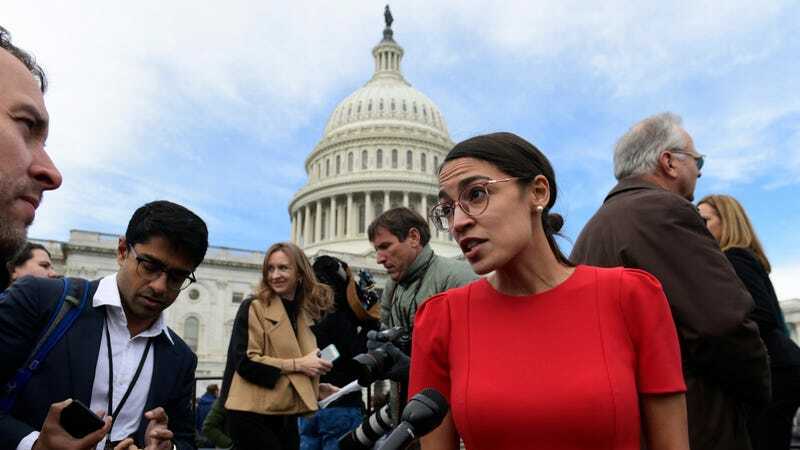 The Green New Deal continues to gain momentum ahead of the next Congress. A combination of incoming and current Democratic representatives and activists kept the pressure going on Friday, announcing new supporters and a day of action before Congress takes off for the year. The number of Democrats calling for a select committee that could come up with the Green New Deal—a plan to rapidly transition our energy system away from fossil fuels—rose to 18 as Representative-elect Mike Levin and Representative Jackie Speier both announced their support. Levin knocked off incumbent Darrell Issa by running hard on climate change but had yet to sign onto the idea of a Green New Deal that will be crucial for addressing carbon pollution in the U.S.
“While the details of a Green New Deal are far from finalized, I strongly agree that we must transform our economy at a pace and scale never before achieved to mitigate the impact of climate change,” he said in a statement announcing his support. At a press conference with other Congressional Green New Deal supporters, Levin expanded on his decision by pointing to wanting a better future for his young kids as well as protecting the resources in his California Congressional district with 52 miles of coastline. The concept of a Green New Deal rose to prominence during the election. The idea is to adhere to what scientists have been saying for years: We have a finite carbon budget and finite amount of time before we burn through it. The tenets of the deal are to transition to 100 percent renewable energy while ensuring a just transition for those employed in the fossil fuel industry and a green jobs guarantee. Thanks to the election of new, environmentally-oriented representatives, the deal has come crashing ashore ahead of the next Congress. Earlier this month, protestors with the Sunrise Movement crashed Nancy Pelosi’s Capitol Hill office to advocate for the deal along with the reinstatement of a select committee on climate change to hammer out the details. With the protest happening during new Congress members’ orientation, Representative-elect Alexandria Ocasio-Cortez joined them, sparking wide media coverage. The groups that support the Green New Deal include the youth-led climate group Sunrise Movement, as well as a constellation of 100 other organizations. And they’re not done reminding representatives of what they want to see come out of the House when Democrats take control in January. Sunrise plans to flood Capitol Hill again on December 10, and the group said in a press release that more than 500 people have signed up to visit their representatives’ offices. While it’s unlikely that any climate legislation will make it to the resolute desk with Republicans in control of the Senate and a climate denier sitting in the White House, that’s not the point of the Green New Deal push. Between the groundswell of support and new members of Congress who take the urgency of what’s needed to address climate change to heart, that last part may finally change.